Anyone who has ever made the acquaintance of Cleveland's ace resident-indie/experimental filmmaker Robert C. Banks Jr. knows that the guy is an enthusiast for film - real film, celluloid. Whether black-and-white, color-reversal, color negative, Banks has been proponent of actual chemical emulsions, in spite of the advances made by relatively bargain-rate, inferior quality (at first) competitors like videotape and digital. Light shown projected through real film frames, he said, is like looking through stained-glass windows, which I always thought was a lovely way to put it. 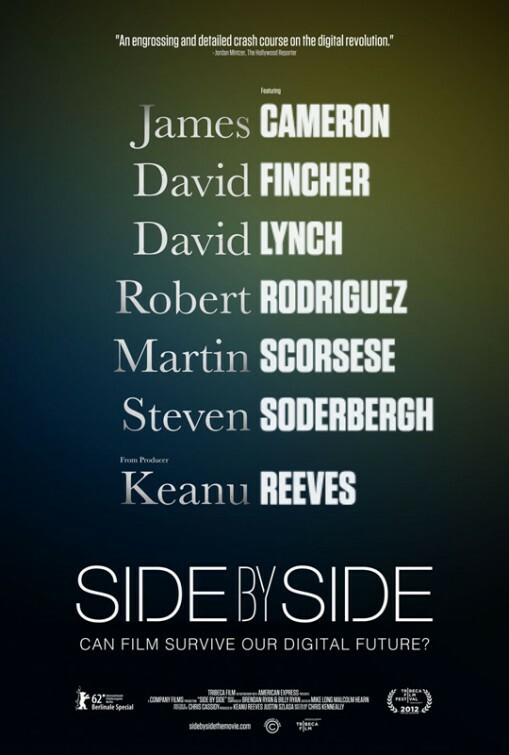 Well, Chris Kenneally's documentary SIDE BY SIDE bids to be the ultimate smackdown in the film-vs.-video argument. It didn't quite cover all bases for me, but there is an all-star lineup and enough issues raised to keep a Robert Banks debate going all night long. On one side is George Lucas, who famously declared "film is dead" and used his latter-career "Star Wars" trilogy as a field test of an all-digital filmmaking process (and, some mean critics might say, all-digital scriptwriting and acting as well), and DV converts such as Danny Boyle and David Lynch. On the other side are celluloid loyalists such as Christopher Nolan (who shot THE DARK KNIGHT RISES on real film) and Martin Scorsese, still champions of light-sensitive silvers and halides - not fundamentally different from when Thomas Edison was in the motion-picture business. Yet, from its jaggy, visible-pixel origins, the high-tech digital-imaging that Lucas championed has come to match film and sprocket holes in image quality adaptability. And thus movie film's exit may be in the script. 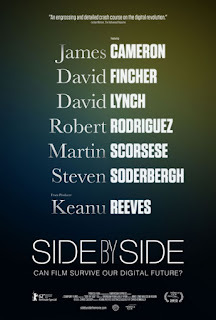 SIDE BY SIDE's host, a low-key but enthusiastic Keanu Reeves, speaks to directors Scorsese, Lucas, Lynch, Boyle, James Cameron, Barry Levinson, Joel Schumacher, Robert Rodgriguez, plus cinematographers and editors on the film/video debate. It turns out to be an artistic/economic choice rife with unexpected and downright Hollywood-esque ironies. Film-load changes and industrial lab processing have enforced longstanding work rhythms on the set - frequent actor breaks and the social ritual of beholding the "dailies." Digital-video shooting and screening on-site can continue nonstop. One speaker recalls a particularly graphic protest against that kind of grind by Robert Downey Jr. Involving urine. With film, the director of photography is an acknowledged artist and savant of lighting, focus and filters. But the high-tech digital automation now in DV cameras just about lets anyone run the camera - even egocentric actors with the clout to demand the best shots of themselves (no, really, they do that? ), or directors hoping to pile one more Wellesian credit on their resumes (while it must be recalled that being a DP was one of the few things Orson Welles did not strongly aspire to, outsourcing instead to the likes of Gregg Tolund and Gary Graver). Then there is the editing process, in which film-shooters had to use tape, scissors and cumbersome flatbed devices in the cutting. Digital filmmakers, doing "non-linear editing" on scaled-down computer suites, do it all electronically in hard drives, and have theoretically limitless choices. But is that a good thing? SIDE BY SIDE's information-download is immense, separating casual movie-gossip hounds from the American Cinematographer subscribers and technophiles wanting to know how Cameron and partner Vince Pace developed their own 3D system for AVATAR, and the deliberate design of the RED-brand digital camera line to become a serious rival to Panavision's dominance. By the end one feels satisfied, if a little wistful, for what looks an inevitable fadeout for film. I did find one angle not addressed (besides film still the default choice for super-70mm ultra-widescreen formats, like IMAX/OMNIMAX), strangely enough, considering how many of these wealthy showbiz folk always want to Save the Earth. It's the environmental impact. Film-related chemical formulas create dire toxic waste and exerts that nasty carbon-footprint fuel tolls in shipping and delivery. Digital does not, and may even reach theaters via online network (something SIDE BY SIDE does recognize). I have to say, unless you're planning to develop film in already-polluted Great Lakes inlets and estuaries (I do believe someone in Michigan did that), video is certainly a more "green" choice than film, one that helped me rationalize all that undeveloped Kodachrome and Ektachrome I have.